Generally the childhood asthma causes due to their inherited traits or infections in the airways at a very young age. Environmental factors like pollution, dust and exposure to other toxic (or hazardous chemicals or gases) are also the crucial factors that can adversely effect on the kid’s health. Even these can cause the deadly problem of childhood asthma, if remained in an uncontrolled state for long. Although many treatments and home remedies are now available to cure the symptoms of asthma attacks in children, using a humidifier can help get better relief than others. A good humidifier in your children’s room works wonder in soothing the airways of your child and thus helps in preventing the future attacks in a significant manner. 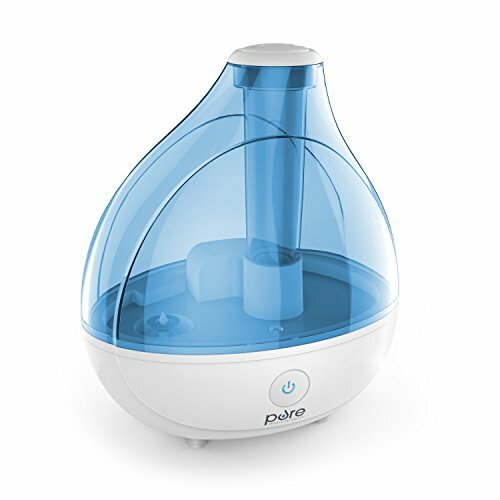 What Type of Humidifier is Best? Do I Need A Humidifier Or Dehumidifier For Asthma? The amount of water vapor in air is termed as humidity. Indoor humidity level is one significant factor that decides the comfort condition inside a living space. For most of us (humans as well as pets) humidity levels between 30 to 60 percent is good to feel comfortable and healthy. Any thing lower as well as higher can make us feel uncomfortable and can cause various health problems. For people who suffer from low immunity problems or respiratory disorders can get affected severely in these unbalanced atmospheric conditions that can lead to problems like asthma. As such maintaining proper humidity levels in balanced form is necessary and this can be achieved by using a most suitable humidifier system at home. Fortunately there are two types of humidifiers for asthma available in the markets to solve your purpose. These are called: warm mist humidifier and cool mist humidifier. Majority of the people use one among these, which is best suited for their problem. However according to coolmisthumidifier.org and many other experts in the field, room humidifiers such as cool mist machine are most preferred and safe to use- when it comes to choosing between warm mist vs cool mist humidifier for asthma. Cool misting devices when run whole night, acts as a great natural childhood asthma treatment by letting them breathe easier all night. Warm humidifiers are comparatively considered dangerous for kids – as small children when gets close to it, can spill off the hot water and can burn themselves. This is one of the major reasons why families prefer using cool mist humidifiers (over other type of humidifiers), especially for home use. 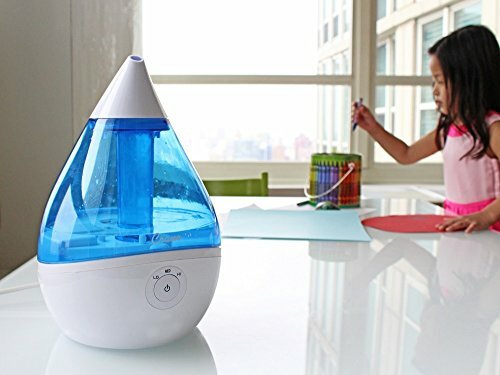 In case you do not have a best humidifier for asthma at your home, you should consider getting it immediately for the benefit of your asthmatic child or toddler. Below you can find some of the best model and reviews. Check them out in detail and buy one for your suffering child now. A humidifier releases cool mist of moisture into the air and keep the air moisturized, hence your infant suffering from asthma problem will breathe moist air and stay less prone to severe asthma attacks. For those of you who are still struggling hard to treat their asthmatic child can try out one among these 5 models that can surely help. Crane USA cool mist humidifier is one of the best humidifier for asthma which is also best suited for kids room. The device comes with 1 gallon tank which is simple, portable and easy to clean. It is light weight and portable to any place you go. It does not require any filter and comes with auto shut-off sensor for safety. Crane USA cool mist humidifier can be used in bedrooms and even in offices. The charming design and the mini size help it blend into the environment perfectly and provide a personal therapy on a finger touch. At stores such as Amazon you will find the best option to buy this humidifier at the best affordable price. 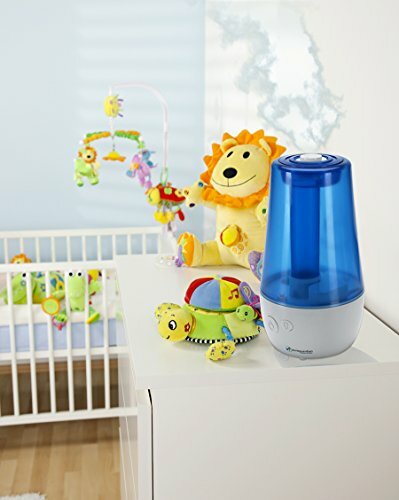 Very effective and pretty in features this ultrasonic humidifier model by TaoTronics works very effectively to give your baby comfortable sleep all through the night without worrying of their asthma and allergy conditions. The body of the unit is made of high quality BPA free plastic which avoids the bacterial or fungus growth on the plastic which may cause stains and odor. MistAire offers you another great option to humidify your kids room. It is good for allergy influenced children and babies and its works with super quiet operation making it best for your kids bedroom. A transparent see through tank (to monitor the level of water). Optional night light which is good for providing relaxation to kids. 24 hours capacity (1.5L tank) once the water is filled properly. Automatic shut off for enhanced security. PureGuardian cool mist humidifier is another best humidifier for asthma. The device is portable and is effective to produce 3 gallons of output per day. However the output may differ according to the room temperature and humidity in the environment. Infuse moisture in the air to give you healthy air throughout the year. Replenishes moisture of the dry skin and eyes, relieves cold, asthma cough, allergies, scratchy throat etc. Preserves the interiors of your home by adding moisture all around to the plants, furniture, paint etc. Reduces the energy consumption due to the humidistat and costs less from your pocket. Purifies air due to antimicrobial additives and reduces static electricity present in the dry air. Vicks brings for you this humidifier in the form of vaporiser to release warm medicated steam for instant relied action for cold and flu symptoms. The water boils in the vaporizer and releases warm water vapors in the air. It makes the vapors free from bacteria and germs and leaves no white dust. 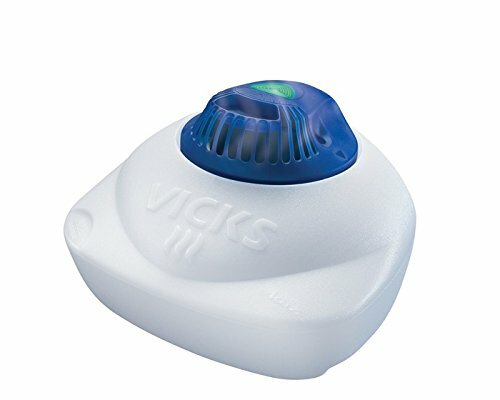 This Vicks vaporizer can hold 1 gallon of water and can run efficiently for 18-24 hours without any trouble. A separate medicine cup is attached to fill the medicine for inhaling to cure the cold and nose congestion. The reservoir comes up with triple insulation to keep the water at a safe temperature. There is automatic shut off function provided in this product when the water reaches the minimum level. A night light is also embedded with the product for maintaining better safety and security. Often people gets into dilemma when they want to get a best humidifier for treating baby asthma. As some of the folks recommend using dehumidifier and others suggest buying a cold mist humidifier, it becomes difficult to decide, what to choose and what not. Well, your buying decision is more or less connected to the place and atmosphere you live in! As running a dehumidifier will help to remove the excess humidity from your home and will balance the humidity levels appropriately, you may need to get this installed when you live at places with high humidity. However if you live at place where there is low humidity level, you need to buy a good humidifier for your asthmatic kid. Using humidifier is also recommended in conditions like cold winters when the atmospheric air becomes too dry to make the asthma and allergies worse. Put a few drops of menthol liquid to the humidifier. This will help soothe and clear air passages. Avoid possibilities of dust and keep the home neat. Avoid using house cleaning agents and other fragrances that have a strong odor. Use an air purifier inside home so that air pollution can be decreased. Although these may not be very effective for treating the complete problem, but hopefully it can help you in managing the attacks. Place the humidifier at a fair distance away from furniture and draperies. Take care of the moistness of the flooring or carpet near the humidifier because such areas can cause mold and bacteria to grow and make your kids more difficult to breathe. Clear the humidifier regularly so that bacteria and mold don’t grow. Use low mineral content water to forbid generating minerals. Never put the water tank remains stagnant for long hours or time. If the indoor humidity level is above 50%, then stop operating the unit. Be sure the unit is dry before storing if you don’t use it for a long period of time. And, clean it thoroughly before next use. Although both the humidifier types (warm as well as cool mist) proves beneficial for baby’s health, there are lot more that should be considered while choosing the best one. Let us check few of these points here. 1- Climate you Live In – For cooler climates the warm humidifier is the best option because it releases steam into the air which makes the room atmosphere warm and eases the congestion within babies. For warm climates like in tropical countries, the cool moisture humidifier makes the room air cool because of the fan which blows air over the evaporating wick filter. 2- Working Principle – Working procedure for both the humidifiers should be kept in mind while deciding to buy a best humidifier for your baby. Warm mist humidifier works by boiling the water inside the tank which then emits warm humid air inside the room for solving the dry air issues. 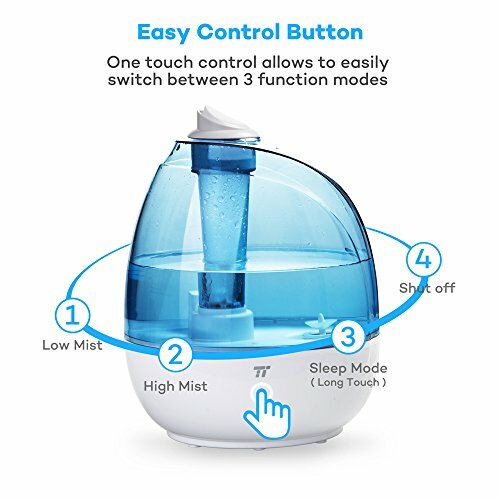 On the other hand cool mist humidifier for babies works by emitting the cold air inside the room by utilizing the wick and fan inside the unit. By knowing the working process of both the humidifiers it is clear that cool mist humidifiers are far better than hot ones. 3- Risk of Injury to Your Small Children – There is a certain amount of risk of getting injured in case of body touches with the hot water pipe of a warm mist humidifier, especially if there are smaller children playing around, the risk is greater. Furthermore the hot steam that emits from the humidifier can be dangerous if children comes in contact with it. Thus it is important to keep your unit at a distance when you use it. This is not the case for cool humidifiers except that hands should be kept away from the operating fan. Thus it is clear that, if you have smaller kids at home you should consider getting cool mist humidifier rather than going with a warm one. 4- Portability – Portability is one of the major concerns for users when they are considering to buy a good humidifier for their babies. Babies often do not sleep at one place or in a single room all the time, this needs to get you a humidifier which is portable and easy to carry from one room to other. Warm mist humidifiers which emits warm mist are designed to have boiler tanks within it and are thus most of times larger than cool mist humidifiers. This makes them less portable as compared to cool misting humidifiers (which are mostly small and portable). Furthermore cool mist humidifiers covers a large area as compared to warm mist humidifiers and are thus suited for larger rooms and home. 5- Maintenance – As warm humidifiers comes with a boiling tank and heater to boil the water, it needs to be washed and sterilized completely in order to eliminate the accumulated minerals inside the tank. Whereas no such regular maintenance is required for a cool moisture humidifier. One can clean the tank daily by regular tap water and stay assured of the health benefits it provide for long. No matter what humidifier type or model you choose, one important thing to keep in mind is getting your doctor’s advice. Your doctor is the right person to ascertain the health condition of your baby and accordingly can advice on choosing the right type of humidifier for baby asthma which is also the best suited for your kids room.